Since the introduction of the Apple AirPods in September 2016, more people have the advantages of truly wireless earphones, which sit individually in the ears, with no need for any connecting wire. Other brands have begun to take notice of the increasing demand for wireless earphones. Data from Google Trends shows that interest in wireless earbuds has grown over the past two years. In 2017, the number of Google searches for wireless earbuds had a search score of 2,009 and this jumped to a search score of 2,309 in 2018. This shows a 15% increase in search volume. Jabra develops headphones, headsets and speakerphones that are designed to look and sound good. They offer products that are suitable for a variety of uses and environments, from listening to music, to making phone calls; and from the gym, to the office. Their Elite range of wireless earbuds are engineered for superior quality when making phone calls or listening to music. The Elite earbuds include Jabra Elite 65t, Jabra Elite Active 65t and Jabra Elite Sport. Each of these wireless earbuds from Jabra are versatile, comfortable and stylish, while providing high-quality sound. The Jabra Elite 65t earbuds promise the ultimate calls and music experience. These earbuds use four-microphone technology to offer quality sound and reduce wind reduction on calls. The 6mm speakers are designed to allow the wearer to block out or choose to let in ambient sound. When you pair them with the Jabra Sound+ app, you’re in control of your music. The app gives you the ability to adjust the sound you hear using the customisable equaliser. You can choose from preset options that help to boost speech or emphasise bass, or select your own preferences for different sound levels. The Elite 65t earbuds offer reliable connectivity, featuring Bluetooth 5.0 to make it easy to connect to your smartphone or other devices. The earbuds offer the capability to connect to your chosen virtual assistant, including Alexa, Siri or Google Assistant so that you can access various information via your headset. They automatically turn on when you take them out of their case and auto pause when one earbud is taken out of the ear. These earbuds are also designed to fit comfortably, with three sets of silicon eargels included to help you get the perfect fit. They have IP55 water and dust resistance to protect them during use. The earbuds offer up to 5 hours of talk time or 15 hours when used with the charging case. They charge within 2 hours, but a 15-minute rapid charge offers an impressive 1.5 hours’ operation. One thing to consider with the Elite 65t earbuds is that they work best when paired with a newer phone. With an older model, you won’t be able to use some of the most useful functions. While this might be fine for some tech enthusiasts, others might not be ready to splurge on a phone upgrade. The Jabra Elite 65t earbuds are a great option for everyday use, both in the office and outside of it. Engineered for the best true wireless calls and music, they offer a good choice for work and play. However, they might not be the best option when doing sports. If you’re looking for wireless earbuds that are great for all-round use, including sports, the Jabra Elite Active 65t could be for you. These earbuds are engineered not just for excellent call and music quality, but also for sport. They provide a snug, secure fit so that you can feel confident and will stay in place as you move. Built for more active users, they feature a dust and waterproof rating of IP56, giving you more protection compared to the standard Elite 65t earbuds. They’re protected from high-pressure water jets, so you can even rinse them off to keep them clean. They also come with a 2-year warranty against sweat and dust. Like the Jabra Elite 65t, you get up to 5 hours on a single charge, and up to 15 when using the charging case, which fits neatly into a pocket or bag. You get all of the other features of the Jabra Elite 65t too, including stellar connectivity and the Sound+ app, so you can set your perfect listening settings. These earbuds also have a motion sensor, giving them an extra edge for anyone who wears them while working out. You can track your fitness with the integrated sensor for optimised workouts. You get the same secure fit offered by Jabra Elite 65t, with three silicon eargels included. Using the HearThrough feature, you can let in noise from the outside world, helping to keep you safe on your workouts. Of course, the one major negative of these is that you could be spending too much if you’re not a particularly sporty person. The extra active features are excellent if you’re always on the move, but paying more for them when you don’t have much use for them is pointless. Having said that, the price difference isn’t too big. The Jabra Elite Active 65t earbuds are a great choice if you’re a more active person. With waterproof and dust-proof protection and the motion sensor, the extra active features are certainly handy to have. Plus, they’re still great for making calls, listening to music, and more. Even the Active version of the Elite 65t earbuds might not be enough for some. If you’re truly passionate about sports and fitness, you might be looking for something that has been designed for rigorous active use. The Jabra Elite Sport earbuds will meet your needs as it offers wireless listening that works for professional training. These earbuds are highly durable, with a 3-year warranty against damage from sweat and IP67 waterproof rating, meaning they can withstand being submerged in up to one meter of fresh water for 30 minutes. The Jabra Sport Life app is available to use with these earbuds, giving you the tools you need to analyse and track your fitness. Features included in the Jabra Elite Sport earbuds that you don’t get in other models include heart rate monitoring, rep counting and oxygen level monitoring. The app provides coaching advice and also offers a race predictor and recovery advisor. These earbuds come with three silicon eargels, just like the other models, and also have three FoamTips in different sizes for an even better fit and level of comfort. With the controls on the Elite Sport earbuds, you can turn the volume up or down, play, pause or skip tracks by touching the earbuds themselves. This means there’s no need to get out your phone in the middle of a workout. You can also answer, end and reject calls using the controls. In terms of battery life, these aren’t as good as the other two models. You get 4.5 hours on a standard charge, and the charging case can give you two charges of up to 9 hours. However, this is still pretty good, and the battery life is more than sufficient for daily workouts. The Jabra Elite Sport wireless earbuds are the ultimate pick if you’re an athlete or a fitness enthusiast. They work well for music and phone calls too, but they’re designed for optimum performance while you’re working out. In conclusion, each Jabra wireless earbud model offers their own unique advantages. Jabra is known for their high quality and innovative designs, and the latest wireless earbud range is no exception. It is definitely worth it to consider investing in a Jabra wireless earbud to meet the demands of your daily activities. 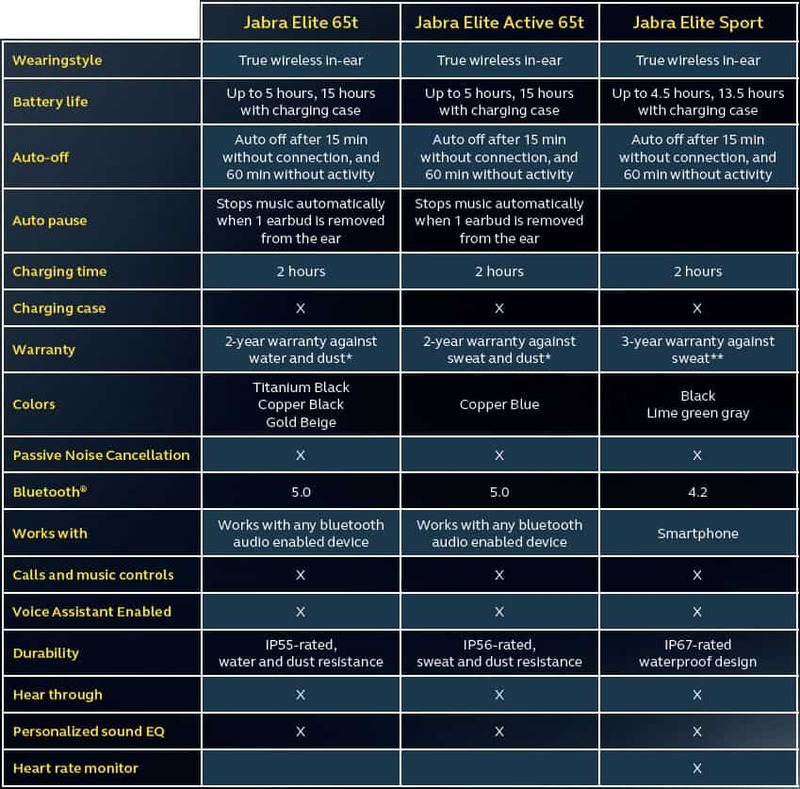 For easier comparison, the following table will help summarise the key features of the Jabra wireless earbud range. Depending on your lifestyle, Jabra has a suitable audio product to meet your needs. The Jabra Elite 65t are ideal for everyday use, from the office to your commute. Jabra Elite Active 65t gives you extra protection for light workouts so you can use them from your workplace to your gym. Lastly, the Jabra Elite Sport option is ideal for professional athletes and those who take fitness seriously. 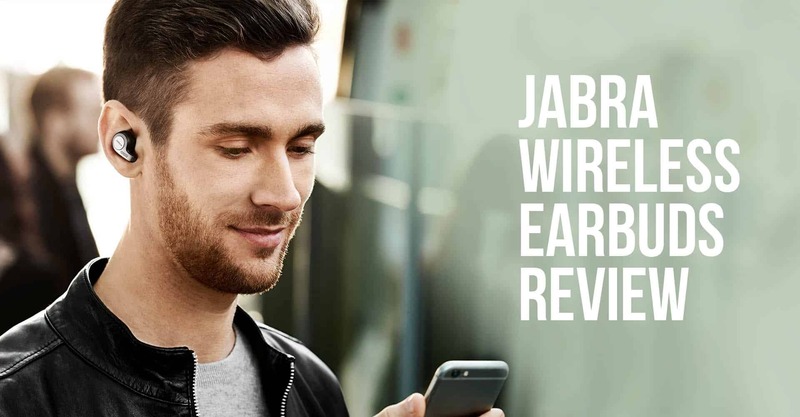 Check out the Jabra wireless range to find the right option to meet your needs.